A University of Toledo researcher is among a group of astronomers to discover a young Jupiter-like planet that could help further our understanding about how planets formed around the sun. The research results are published in the current issue of the journal Science, which is the world’s leading outlet for science news published by the American Association of the Advancement of Science. This is an artistic conception of the Jupiter-like exoplanet 51 Eridani b, with the hot layers deep in its atmosphere glowing through the clouds. Because of its young age, this cousin of Jupiter is still hot and carries information on the way it was formed 20 million years ago. 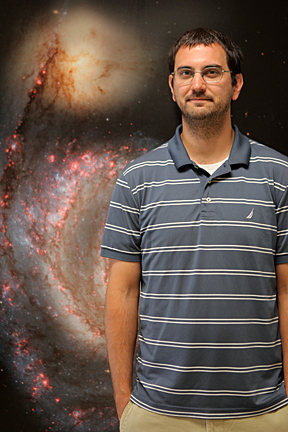 Dr. Adam Schneider, a UT astronomy postdoctoral research associate, is among scientists to discover the exoplanet. The image was created by Danielle Futselaar and Franck Marchis of the Search for Extraterrestrial Intelligence Institute. Dr. Adam Schneider, a UT astronomy postdoctoral research associate, and the research team led by Dr. Bruce Macintosh, a professor of physics at Stanford University, identified the planet, called 51 Eridani b, about 90 light years away from Earth using the new Gemini Planet Imager on the Gemini South telescope in Chile. The Gemini Planet Imager was designed to discover and analyze faint, young planets orbiting bright stars. While thousands of planets have been discovered, it has previously been done indirectly by detecting a loss of starlight as a planet passes in front of its star or by the gravitational wobble of the star induced by the planet. This new technology searches for light from the planet itself, which astronomers refer to as direct imaging, and 51 Eridani b is the first planet discovered with the Gemini Planet Imager. The planet is a million times fainter than its parent star, 51 Eridani, and is orbiting a littler father away from its star than Saturn does from the sun. Observations reveal it is about twice the mass of Jupiter, making it the lowest-mass planet ever imaged, and it also is one of the coldest at 800 degrees Farenheit. Schneider’s role was target identification for the research team to identify the 600 celestial objects for the Gemini Planet Imager Exoplanet Survey that will continue during the next several years. 51 Eridani b is the 44th target of the 600 in the survey and was first observed in December. To put that in perspective, our sun is 4.5 billion years old. A young star, by comparison, would be less than 100 million years old. This object is about 20 million years old, Schneider explained. In addition to expanding the number of known planets, the goal of the exoplanet survey is to provide clues as to how solar systems form through the study of these young planets. 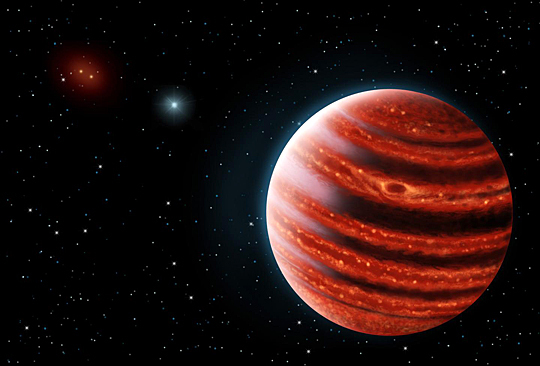 The characteristics of 51 Eridani b are similar to what research models suggest Jupiter was like in its infancy. This entry was posted on Thursday, August 13th, 2015 at 2:00 pm and is filed under Natural Sciences and Mathematics, News, Research, UToday .